Whim Quarterly had its launch last night at the Three of Cups Lounge on the Lower East Side, with a night of great stand-ups, free(ish) magazine copies, and discount drinks. To go along with its official launch, the Whim Quarterly website is now up and running with more than just magazine ordering information (although that's still the most important part - ordering a copy is the only way you'll get to read the two pieces written by me, along with all the other fantastic content*). Why don't you go check out the website. We'll wait right here. *Why not give some for Christmas? Or Hanukkah? Or The Feast of Cthulu? My webseries 9 AM Meeting won two of the four categories in which it was nominated, at Thursday's NYC Channy Awards. I picked up a statue for Best Animation or Special Effects and my collaborator Matt Koff and I got the award for Best Writing. It was a fantastic show, and many thanks to everyone who organized and put it together. The Writer's Guild of America East put out a press release about our win here. And you can read a summary of the show and get a list of all the winners on The Apiary. The Flop House Episode Fifty-One is ONLINE! To borrow a line from Patton Oswalt: You like Wolverine? Well, in my movie you get to see Wolverine as a little kid! 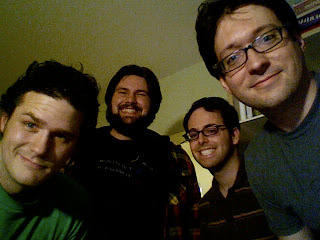 Meanwhile, Stuart suggests an alternate Wolverine history of the United States, Elliott suggests some novel super-villains, Dan makes Elliott do a spit take, and contest winner Dash has the decency to be a really nice guy and not a serial killer we were foolish enough to let into the apartment. 51:56 - 54:19 - Goodbyes, theme, and outtakes. Thanks again to our contest winner for coming out from New Jersey to Brooklyn to be on the show. He has A PODCAST OF HIS VERY OWN. It's called "We're Friends!" Why not check it out? 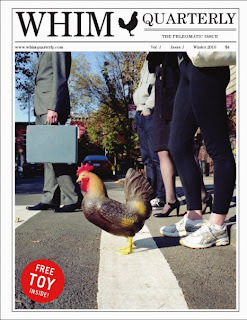 If you live in NYC, then you should come to the launch party for the all-new print humor magazine Whim Quarterly. Dan and Elliott have two pieces each in the inaugural issue, and both will be in attendance - Elliott onstage doing stand-up, and Dan at the bar taking advantage of the discount drinks. Not One, but TWO Mr. Whitepants Shows This Weekend! If you can't make the amazing, wonderful show that is the Mr. Whitepants Comedy Hour this Friday 12/4 at The Magnet Theater, you will have a second opportunity to come see the amazing, wonderful show that is The Mr. Whitepants Comedy Hour this coming Saturday 12/5 at The Creek in Long Island City. Wait...WHAT!? Did we really just give you not one, but TWO opportunities to come see the amazing, wonderful show that is The Mr. Whitepants Comedy Hour this weekend? !